In addition to a great main game, Typing of the Dead contains a comprehensive battery of training exercises. In fact, the tutorial and drill segments are so deep that the game actually qualifies as a legitimate typing tutor. (Move over Mavis Beacon; the undead have arrived to take your place.) Ever wonder why your F and J keys have those little nubs on them? Get Typing of the Dead, and you�ll find out why. There are exercises covering speed, accuracy, reflexes and much, much more. You're rated on how well you type, and the game will even display statistics on your mad typing skills including areas you need to improve upon. In all seriousness, I�m thinking of letting my children play this game, if only to teach them how to type. Also, there�s a cool two-player mode, where players can compete with one another for kills. If the game weren�t so much fun, I�d probably dismiss the two-player mode as an unabashed attempt to sell DC keyboards. But, believe me, it�s well worth the investment. Quick! How many S's is that? 1... 2... 3... Oh no! While the typing does make the game a unique experience despite being basically a reissue of House of the Dead 2, the challenge is dumbed down quite a bit. While the game initially seems to just replace fast shooting skills with fast typing skills, the fact that you are stuck blowing up exactly what the game shows you removes both an extra element of skill and exploration the original required. House of the Dead 2 is a very challenging gun shooter -- among the most difficult ever made. It's not only a test of shooting zombies but also crates, vases, and so on to uncover much needed life and score bonuses. While objects other than zombies can be fired upon, they are few and far between when compared to the game which inspired it. Also, the items are already exposed, and typing a single letter will grant you the power-up -- much much easier than the split second targeting and firing reflexes House of the Dead 2's hidden bonuses required as they flew by the screen. The game not only lacks the element of exploration in the original, but it also removes another integral part of the gameplay which makes House of the Dead 2 such a great gun game -- the revolver. Having a revolver limited your ability to mow down zombies without fear -- with only six shots to spare, there was little room for error. You never have to reload in Typing of the Dead, and, while that may be an obvious concession for a typing-based game, it still is another factor which dumbs down the challenge. While I still have difficulty making it through House of the Dead 2, Typing of the Dead is much more forgiving. Practice your mad typing skillz with G.
While I can forgive the voice acting, I'm sure others won't be able to make such a concession The voice acting is bad. It was bad in House of the Dead 2, and it�s still just as bad. Personally, I see this as a good thing, because the bad voice acting adds to the overall campy feel of the title, but many gamers might not share my opinion. The simple fact that so much of the game borrows from House of the Dead 2 makes it feel not quite its own as well. It's unique concept, but not wholly original with its presentation. 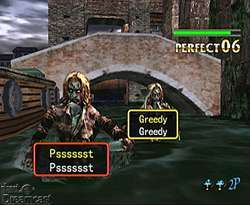 Another, perhaps minor, point: With so much emphasis placed on the act of typing, I�m not sure whether Typing of the Dead really qualifies as a killer gaming experience. All throughout, the game has a real satisfying "the meek have inherited the Earth" feel. In other words, simply on an intellectual (read "pure geek") level, I take giddy delight in knowing I can blast hell out of a whole zombie army simply because I�m a semi-okay typist, but therein lies the rub. Typing of the Dead really does have "typing tutor" emblazoned all over it. While the title is a fun typing experience, it doesn�t altogether come off as a great game. Anyway, whatever. Whether you look on this title as a great typing experience or a great gaming experience, suffice it to say you�ll have a great experience. If nothing else, Typing of the Dead is kooky, fun and inventive, and a worthwhile addition to any Dreamcast enthusiast�s library. Uh, provided you own one of those keyboards.